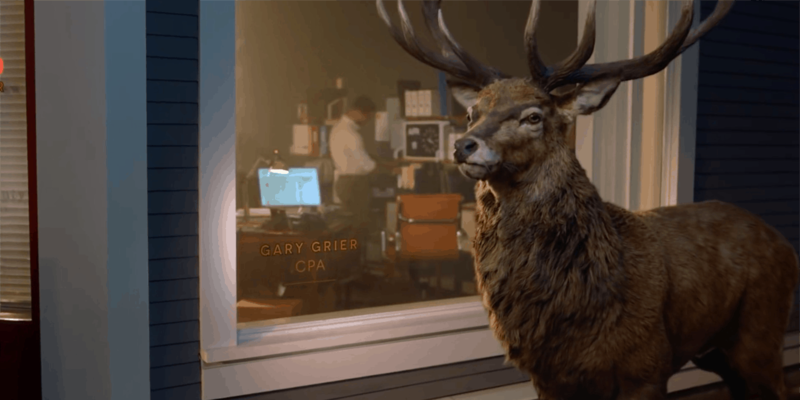 Financial services giant the Hartford started using a mature male deer in its television advertising in the 1970s, but the majestic mascot dropped out of sight a decade ago. Now a brand update and a new agency have brought him back and given him a voice for the first time, via several just-launched commercials targeting small businesses. The campaign is part of a broader effort for the Hartford that bucks the trend, so to speak, of wacky insurance ads that feature freak accidents (a la Farmers Insurance “Hall of Claims” and Allstate’s “Mayhem”), over-the-top sight gags (Geico) and full-on Kraken attacks (Mercury). The Hartford, which has revamped its website and other marketing with the umbrella tagline “The buck’s got your back,” aims to put its purpose-driven foot forward with a serious (though not weighty) tone that, at this point, could make it stand out in the category. The company has also rolled out a new mission statement, “We underwrite human achievement,” to convey the message that “people are capable of achieving amazing things with the right encouragement and support,” says Kathy Bromage, chief marketing and communications officer. The focus is on the consumer (“pursuing their unique ambitions, seizing opportunity and prevailing through unexpected challenges,” Bromage says) rather than the messes that need to be cleaned up via an insurance claim. New work from Terri & Sandy has the buck (voice actor David Aston Reese) narrating 30-second spots that sing the praises of several young entrepreneurs (tagline: “Nothing small”). There’s Hugo the barber, described as “a wizard of whiskers,” Bridget the baker (“a Leonardo of layer cakes”) and Gary the accountant (“a titan of taxes, a ruler of receipts”). The mascot comes to life with CGI from the Mill, but agency execs purposely didn’t want the buck to “talk” on camera (as in beer ads and all family flicks). The mascot has been part of the brand logo since the 1860s, and Terri & Sandy considered him “an under-leveraged equity” that was front and center at the company’s stately Hartford, Conn., headquarters but absent from ads since about 2008. Spots, from Swedish director Filip Engstrom of Smuggler, will air on cable channels like CNN, Bloomberg, MSNBC and Fox Business and streaming platforms such as Roku and Hulu. The campaign also includes print, digital, social and out of home.